Shenlei has been a good friend of mine since I was only 6 weeks old. 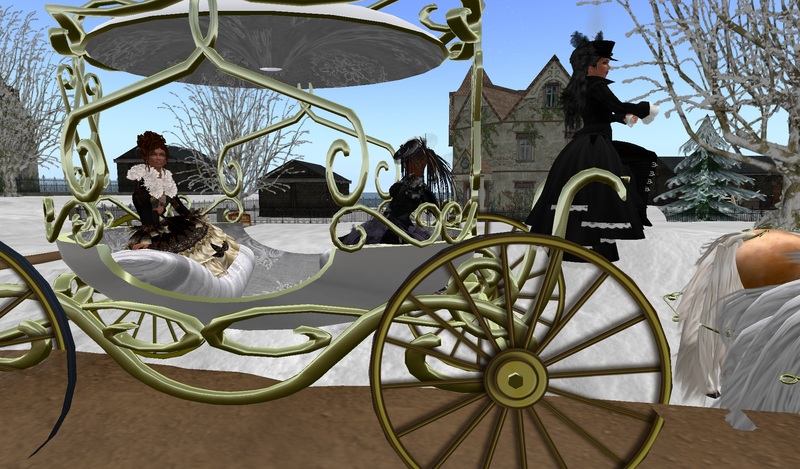 She took me under her metaphorical wing and helped me navigate fashion, fun and friends in SL. She still spoils me outrageously, giving me wonderful gifts. 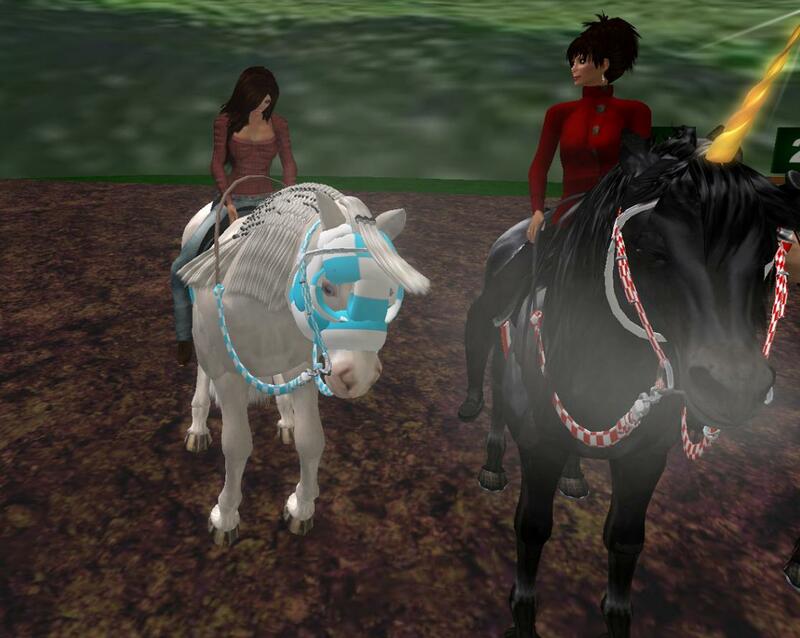 Shen and I share a love of horses and things associated with horses. 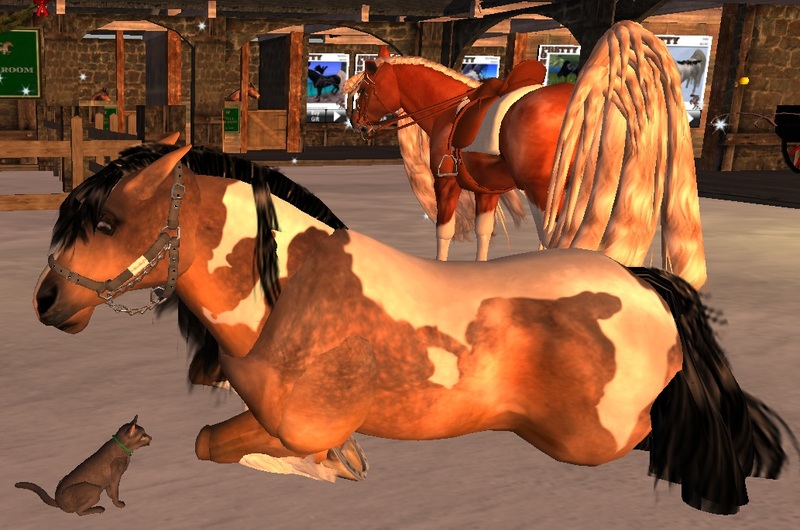 I love to hang out at Carriage Trade with her and the horses (and the barn cats) and the other folk. 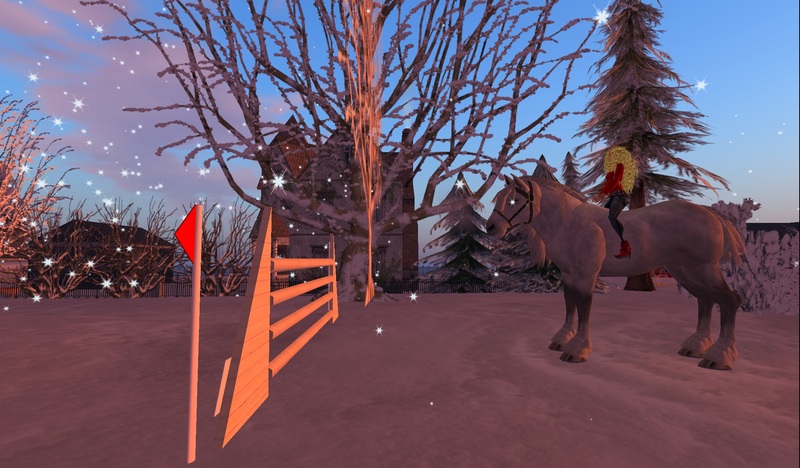 But I can’t always get over there and Shenlei gave me a way to assuage my horse-deficiency all on my own. I am now the proud possessor of the @CT@ Riding Horse (wear me). I confess that it’s not quite as much fun as riding out with one of the CT horses, but for a quiet outing by myself, it’s lovely. I introduced my horse, who I am naming Shamrock, by the way, to the ducks. As usual, they were pleased to see me enjoying myself, but didn’t really understand the need for 4 legs. 🙂 Bamboo liked Shamrock and had a good time riding about the property with me. Shamrock and I have headed out a few times now, to check out the neighborhood. I do see a good bit more astride Shamrock than I do in one of AnnMarie’s crazy vehicles or on my Snowmobile Reindeer. I had no idea there was an amusement park so close to home – a simple ride away. 🙂 There is more coming on THAT topic! I love horses. I love riding. I love water. I love roses. I love red. Mix that all together and you have another perfect evening spent in SL. Oftentimes the only thing that soothes my soul is the sound of hooves beating on the ground. Wind through my hair. Water splashing underfoot. 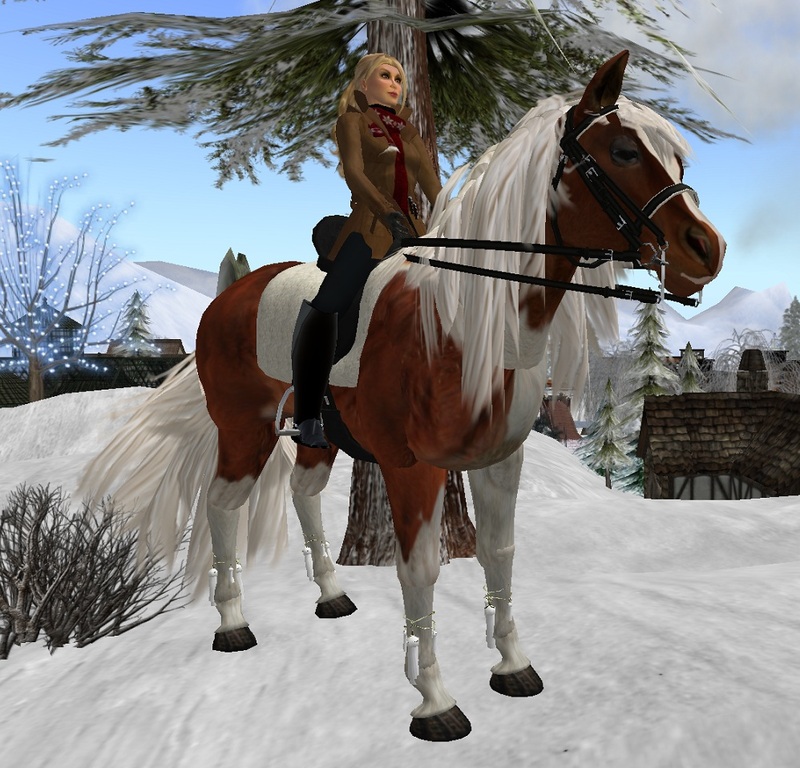 When Moonsorrow invited me to come for a ride I jumped into the saddle. *grin* Moon always claims that the rider needs to beware: that Moon will roll them, toss them, bounce them. It’s all a myth. Moonsorrow has an extremely smooth gait and is ALWAYS considerate of riders. Moon, Shenlei, Tyr and I went for a run through Carriage Trade. Stolas joined us for a bit as well as we toured. CT has begun a role-playing area and we took a look there. There’s been a lot of redevelopment and renovation since my last visit (which was WAY too long ago). It was fun to see the new shops, including the travel agency. *grin* Be sure to book a trip to visit CT. I love the shadows in SL. I have a graphics card that can render them without crashing (that is, not TOO much – unless I try to take lots of pictures, in which case I do ultimately confuse the heck out of the graphics card and the screen goes black. I gather this is an SL bug.). So as we raced across hill and stream, our shadows flowed with us. Notice the shadow on the water! I was having a wonderful time trying to capture the shadows and the details, all of which add to the sense of really being there. I love how my brain can fool my body into believing we are somewhere we are not. The cross-country course has been redesigned as well. I’d spent some time here when it first opened. Fidget was kind enough to take me through. 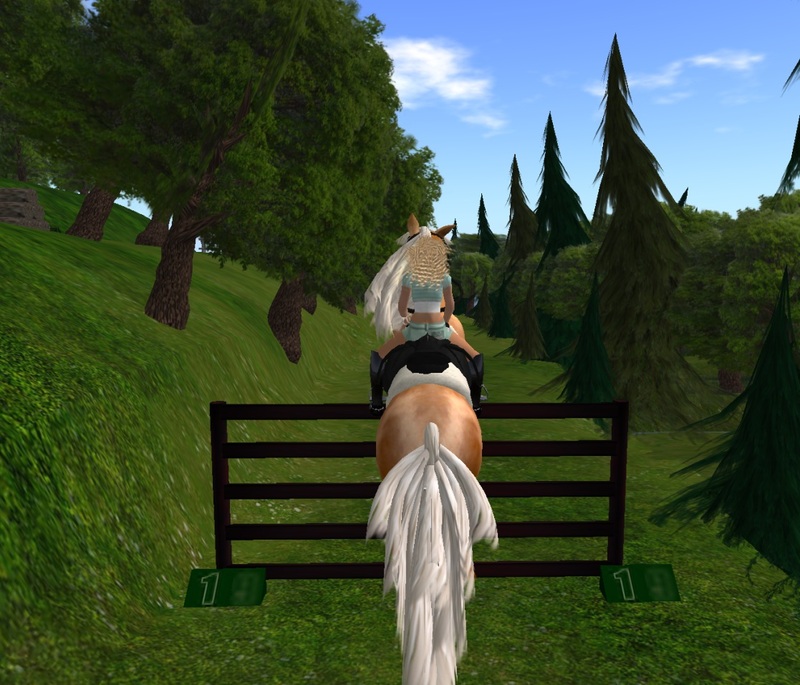 The course is now longer and more complicated and includes ten more jumps for a total of thirty hurdles. Moon did beautifully, only nicking a few of the larger jumps. I did my best to keep a light hand on the reins and let her take the lead. I know which of us knows how to do this best. *grin* I’ve included a photo from the time Fidget and I did the course. Not really the best angle perhaps for either of us, but I wanted to show the comparison of shadows on and shadows off. There is something about time spent with horses that is good for the soul of Ahuva. I was sitting at home last night, feeling a bit sorry for myself. I’d suspected that a dear friend was lying to me. The proof that this was so was now staring me in the face. I don’t like to believe this kind of thing. I felt disheartened and sad. I tp’d to a few music events but my heart wasn’t in it. I was hanging out, listening to the blues, wondering if I should take action or just fade away quietly. Shenlei IM’d while I pondered. 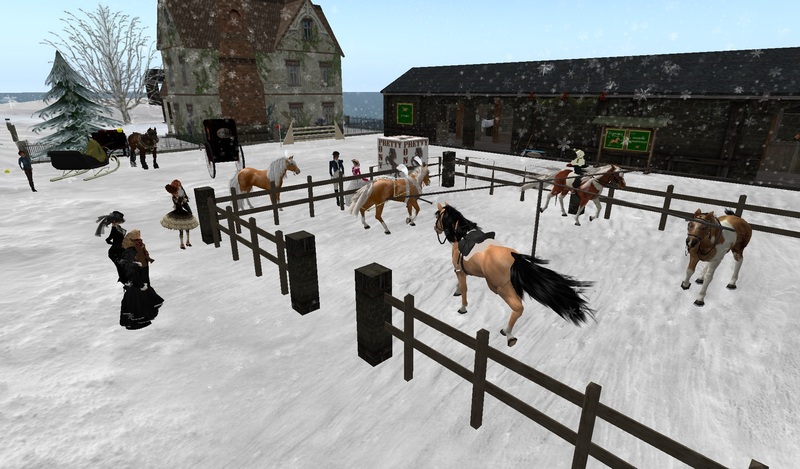 There was a race starting at Carriage Trade in a few minutes, and while they had plenty of horses they were lacking in riders. Would I please come and be a rider? I replied that I wasn’t feeling very sociable. Shen assured me that all I had to do was sit and smile. I wasn’t certain I could manage the smile but I could sit. 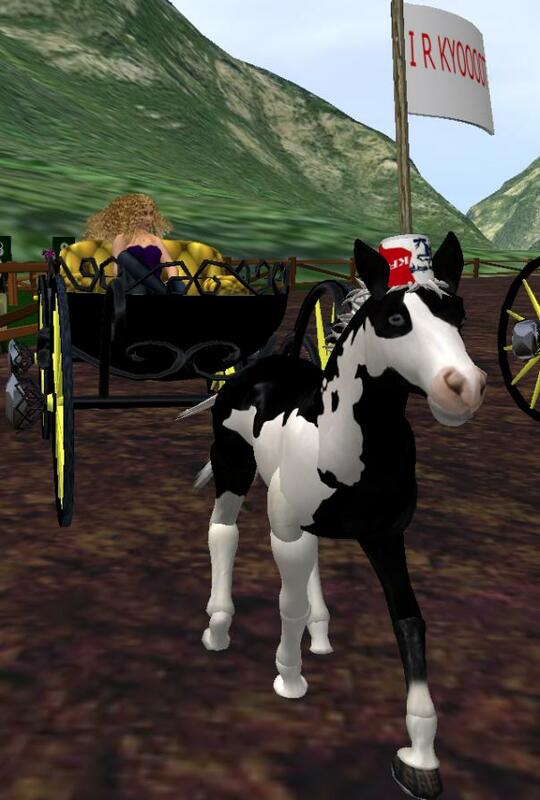 So I took off my stilettos and put on boots and took the taxi to Carriage Trade. 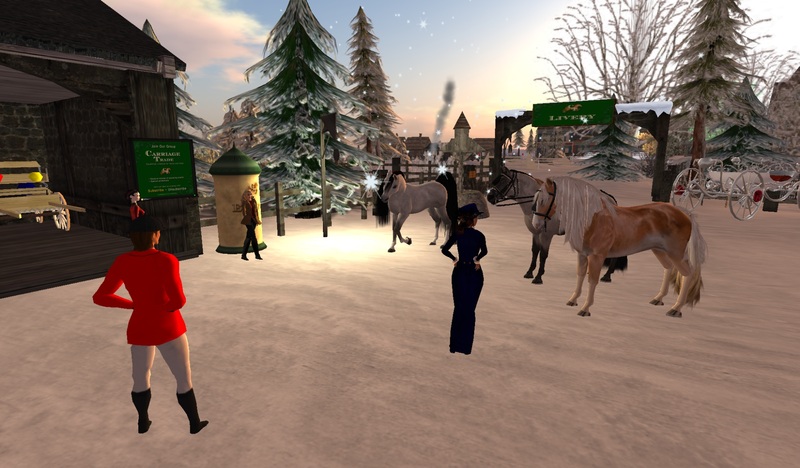 When I arrived at the paddock I saw PatriciaAnne just rezzing as well! I haven’t seen Patricia in ages! I was introduced to Aariyah, a beautiful mare. Aariyah and I would be paired for the race. I think that Patricia was riding Starbuck. We were still shy one rider so I checked my friends list. Bailey was on, so IM’d her, asking if she wanted to ride and had a moment. What great good luck! Bailey would come and race! I haven’t seen Bails in ages and ages – I think since December when we had a Crown and Pearl reunion. Bailey rezzed in and we had a complete field! I think Bailey was on Ghost. 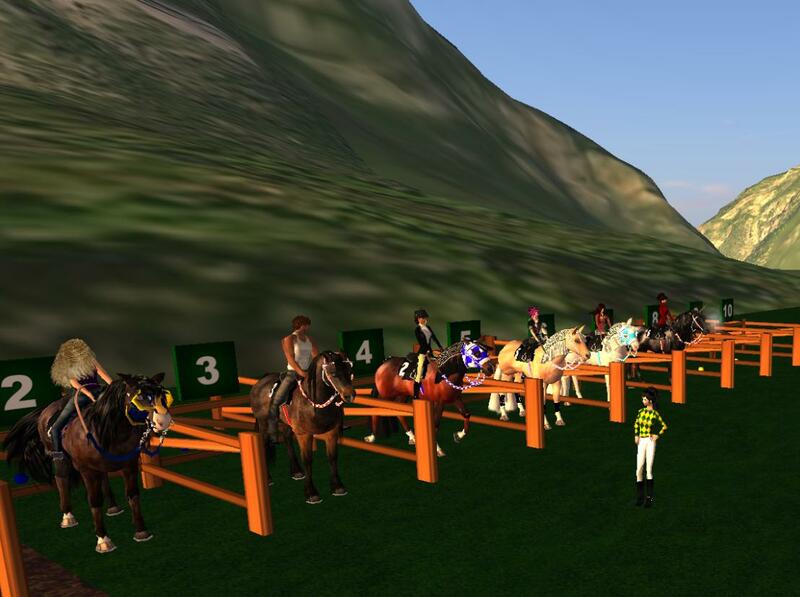 All the riders and horses were lined up in the paddock. 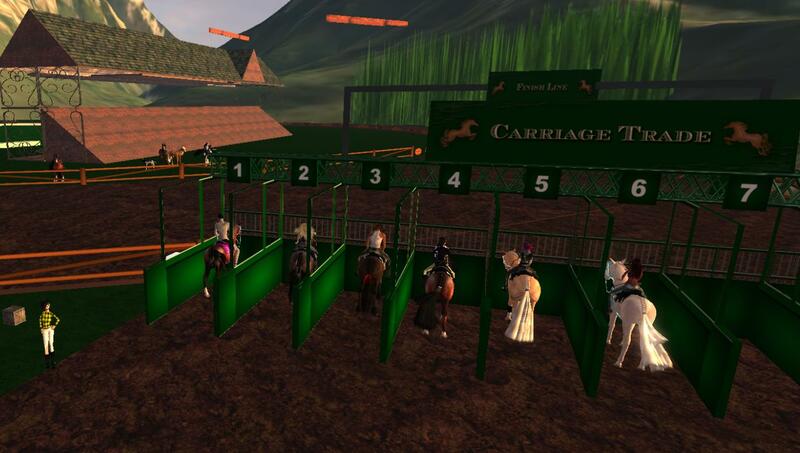 The moment had come to enter the starting gates. We all filed in, with very little fuss. 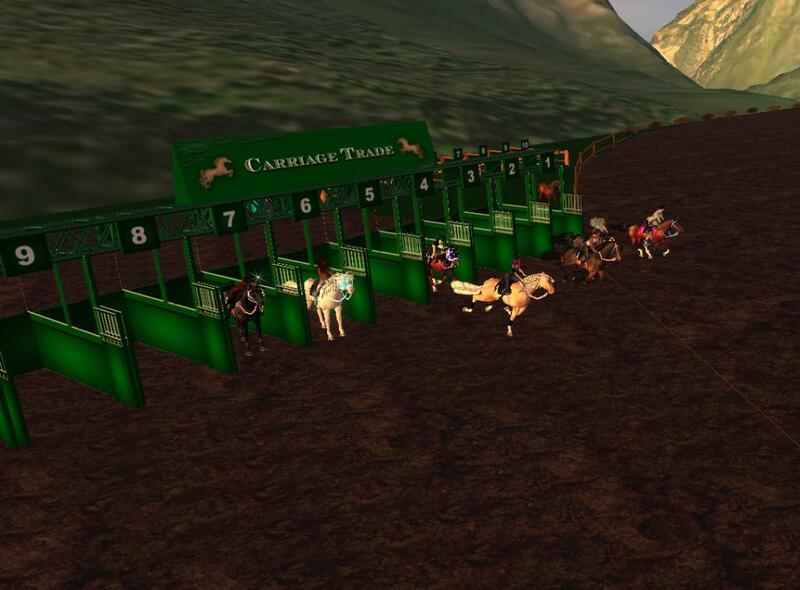 These horse do NOT refuse to load into the gate – they can’t WAIT to race! Soon everyone was loaded into the proper position. Race Starter: Prepare to race. And Rosemount was the winner!!! *smile* Congratulations Rosemount!!!! We actually ran a second race, but Bailey and I were laughing so hard by that point that I don’t know who won. It was getting late and several horses and riders had to leave. But there were still enough left to switch to the foal carts. I sat in a cart pulled by Umaki-Chan, a filly with spirit and a lot of pride – justifiable pride. She certainly is not only KYOOOOT, as she points out, but she is FAST!!! We turbo-charged around the course. By the end of the evening I was feeling much happier. I’d spent the evening with friends – laughing, playing, relaxing. It was a great time. And a needed reminder that while some people are not very good at the friendship/honesty gig, most of the people for whom I care are among my most valued ‘possessions’. It was wonderful fun to spend an evening with friends. Thank you all! I have been trying to avoid hunts in SL. 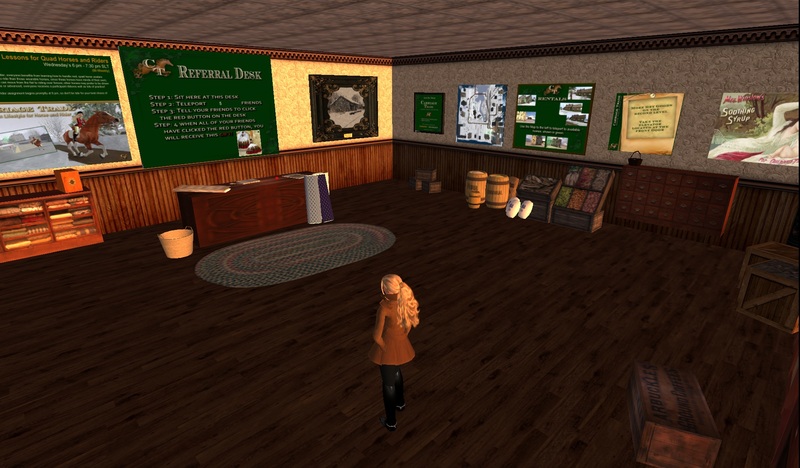 From my very first days I was lackadaisical about keeping my inventory neat and orderly. I had it somewhat organized. Then I took part in a hunt one Easter and blew the whole system right out of control. I STILL have boxes from that hunt that I’ve never opened. Every now and then I start off on a hunt and then realize I don’t have the patience, time or inventory skills to follow through collecting all the wonderful prizes. But I may have to bend a bit. 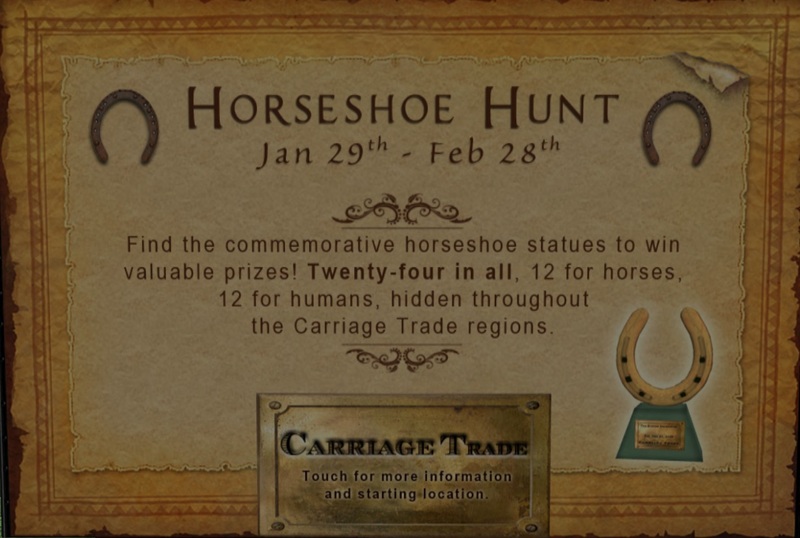 Carriage Trade is running a hunt from January 29th to February 28th. That’s a short time period. Even better (from my pov), there are only 24 prizes. 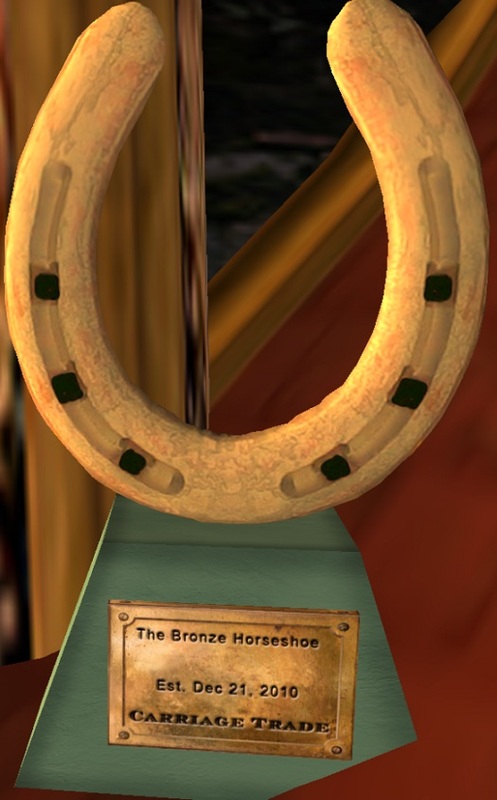 Hunters are seeking 24 commemorative bronze horse shoes, each containing something special for horses or humans. 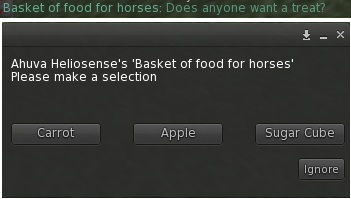 There are 12 horse items and 12 human items. *grin* That works for me. I wandered over there this evening to check it out, see if I could get any “insider” information for you all. You know you can rely on me. 🙂 I learned that there is a notecard of Hidden Hints. How do YOU get the Hidden Hints? Ask the horses. Straight from the horse’s mouth, as they say. All of the CT horses (residents of CT) have the notecard. The horses are friendly, good-natured and love to help. 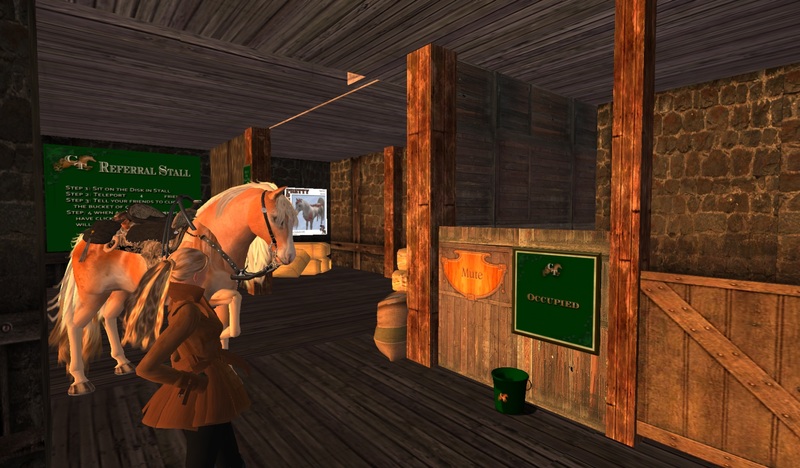 So head on over sometime this month, and wander about, meet the horses, and find some horseshoes for good luck and good fun and good prizes! 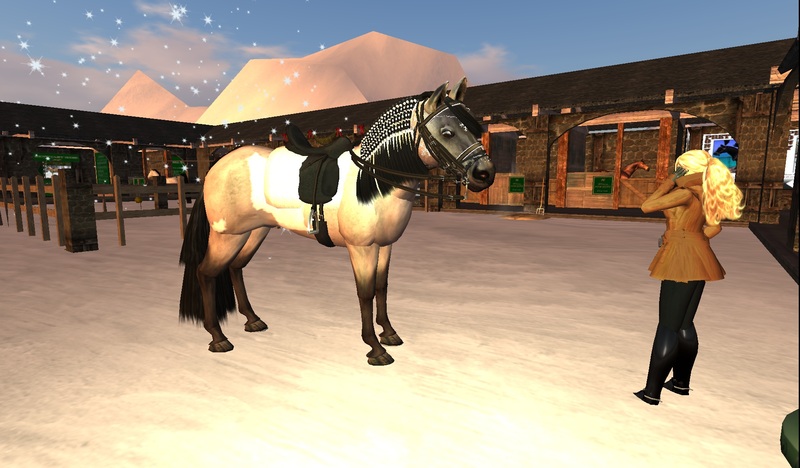 Hanging about at Carriage Trade has made something abundantly clear: I have LOTS of chocolate and wine in my inventory, but not too many horse treats. I headed over there the other day to take some photos of the shops and stable. I was hoping In The Habit was open (it wasn’t then but is now) so I could perhaps add a bit to my clothing inventory. Because you know I NEEEEEEEED more boots. 🙂 After taking some pics around the shops, I went to the stable. Chancy, a beautiful buckskin, was there when I arrived. We started chatting. She asked me about the group rules and about the sim. I really didn’t know much more than what it said on the sign and said so. Moonsorrow, a lovely Arabian, showed up while we talked, asking the same questions. When Mute, a handsome palomino, came seeking the same information, I IM’d to Georgianna. Help! We all have questions. It was truly fascinating. 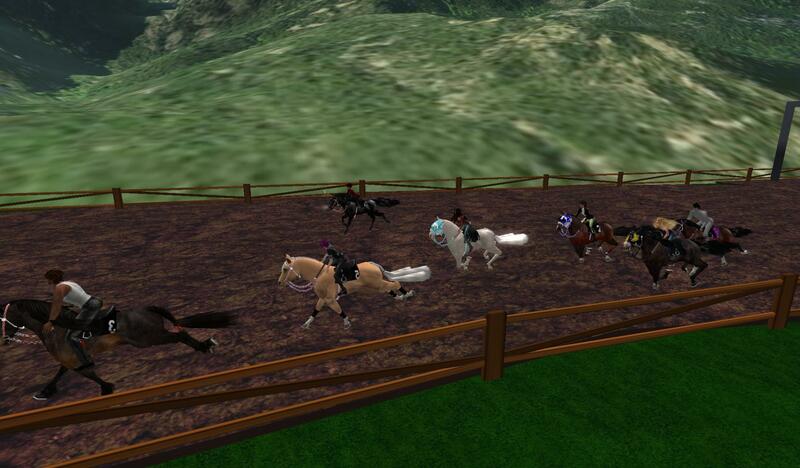 The horses can join the group, rent stalls and some other benefits. 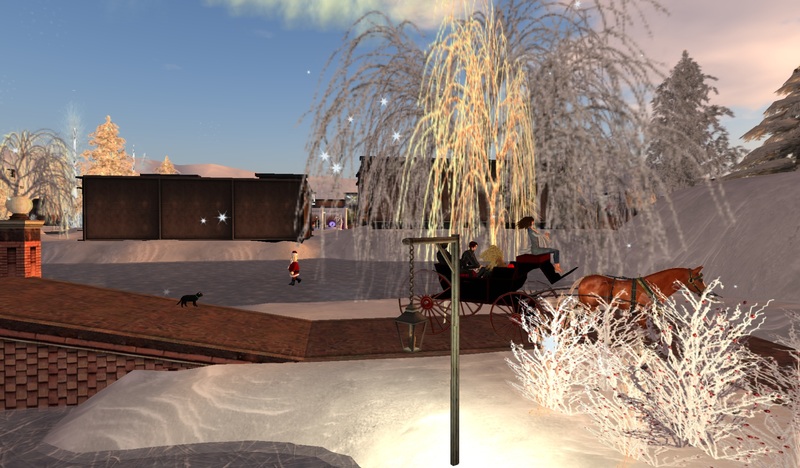 People can come to the livery to ride or take out a carriage. There will be a cost for that. 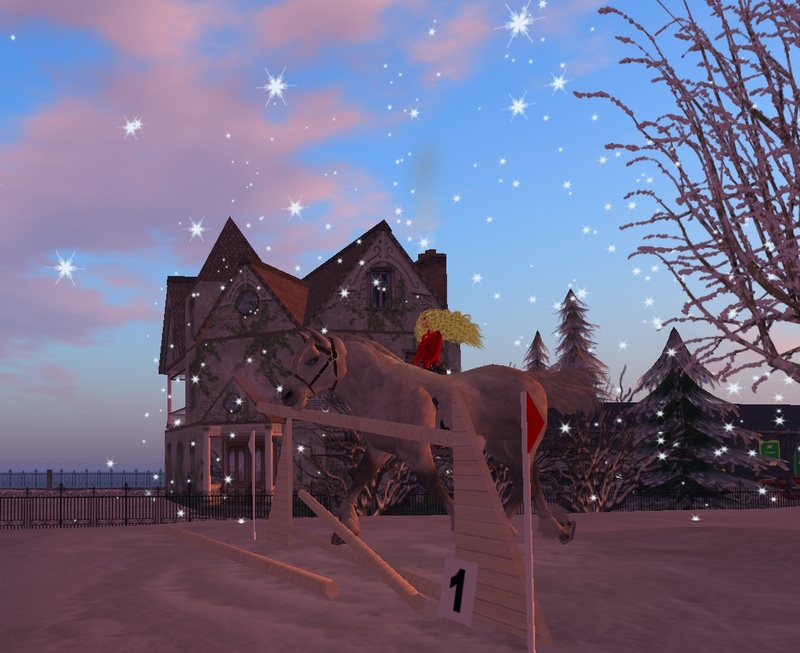 The horses and the sim will share in that. *grin* I think that’s great! 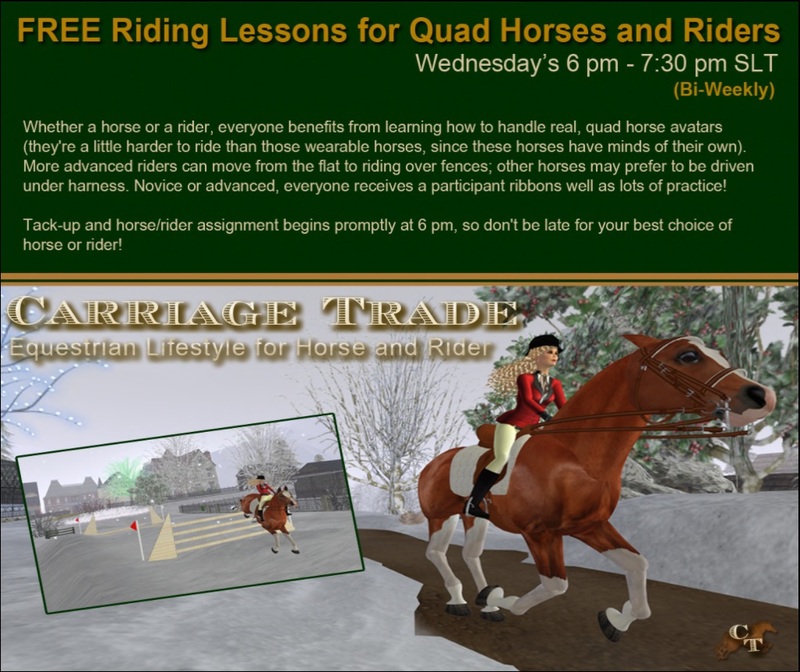 It’s a wonderful way for people who would like to ride to find a mount willing to take them. The horses make money and have fun and don’t have to support the overhead. It apparently sounded fine to Mute also, who rented a stall. I looked for a suitable stall-warming gift. I was SURE I had an apple somewhere. 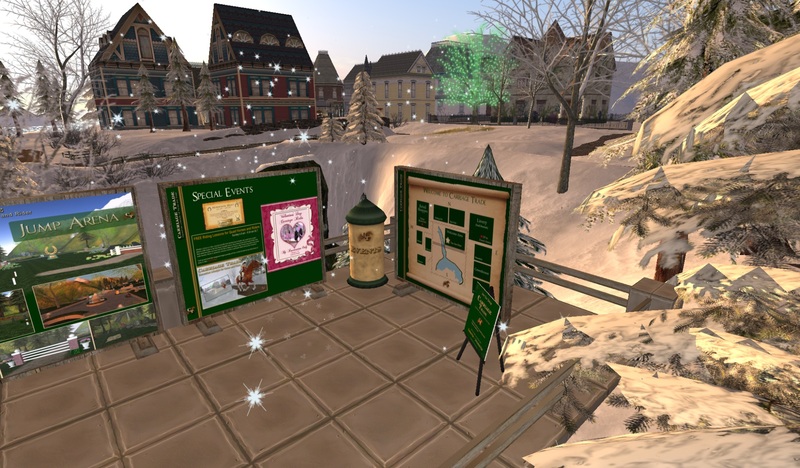 I found it finally – rezzed one on the ground and passed one to Mute. But that wasn’t satisfying. It seemed to me that a stall-warming gift or a treatsie should be more interesting than that. I resolved to do better. I returned home and built a basket. Yes, you read that correctly. I dug out my building skills and made a basket. (I confess – first I IM’d Honour and whined that I needed her to build me something. And then realized – hey – *I* know how to do THAT.) My friend had already passed me carrots and sugar cubes and a better apple. I put the foodstuff in the basket. I’d forgotten how to wear the basket properly. I IM’d to Shenlei for help on that one. Oh, right – poses and script. Done. My wonderful script teacher HellspawneD had taught me how to make a script that offered a choice, so I modified that for carrots, apples and sugar cubes and headed back to the barn. I tested the basket on Belvidere and Apollo. They seemed to like it. I noticed a problem, however. Given the choice between nutritious carrots and sweet sugar cubes, the horses chose sugar. Repeatedly. THAT is NOT healthy. *grin* So I resolved to brush off my scripting skills and modify the script again. This time I’m going to LIMIT how many sugar cubes a given horse may have in a given SL day. That’s right, Mom is watching. 4 carrots, 2 apples, 2 sugar cubes in an SL day. I’ve already put Dale and Hell on notice. I also met another of the barn cats – Midnight. I LOVE SL animations. If you touch Midnight, there are options for petting, following, meowing. 🙂 We all went out for a ride, and Midnight followed right along. I can see that I will have to add cat treats to my basket.